Recent developments in Syria and Lebanon point to military escalation, namely the evolution towards a broader regional war, which has been on the drawing board of the Pentagon since 2004. The borders of Syria and Lebanon are surrounded. British and US troops are stationed in Jordan, The Turkish High Command in liaison with NATO is providing military support to the Free Syrian Army. Allied naval forces are deployed in the Eastern Mediterranean. The deployment of allied troops on Syria’s southern border is coordinated with actions taken by Turkey and its allies on Syria’s Northern border. Meanwhile, Turkish Foreign Minister Ahmet Davutoglu has demanded the support of NATO against Syria under the doctrine of collective security.“We will do what needs to be done if our border is violated again,” he told reporters on October 13. Foreign Minister Davutoglu pointed to the alleged violation of Turkey’s border by Syria as a violation of NATO’s borders. Under Article 5 of the Washington Treaty, an attack on one member state of the Atlantic Alliance is considered as an attack against all NATO member states. Moreover, the actions of Israel and Turkey are coordinated in the context of a 30 year old military alliance directed against Syria. Under this bilateral agreement Turkey and Israel agree “to cooperate in gathering intelligence” on Syria and Iran. During the Clinton Administration, a triangular military alliance between the US, Israel and Turkey had unfolded. This “triple alliance”, which is overseen by the US Joint Chiefs of Staff, integrates and coordinates military command decisions between Washington, Ankara, Tel Aviv and NATO headquarters in Brussels pertaining to the broader Middle East. The bomb attack which devastated a Christian neighborhood in Beirut on October 19, resulted in 8 deaths and more than 80 wounding. Within hours of the attack, the Western media as well as the US State Department intimated, without a shred of evidence, that Damascus was behind the bombings and the death of Lebanon’s internal security service, Brig. Gen. Wissam Al-Hassan. While there is no evidence of the Syrian government’s involvement in this attack, several observers have pointed to the fact that the bombing on the Christian neighbourhood in Beirut bears a resemblance to those carried out by the “opposition” Free Syrian Army (SFA) in Syria’s Christian communities. The October 19 Beirut bombing has the hallmarks of a false flag attack, a provocation intended to trigger sectarian warfare within Lebanon, as well as destabilize the March 8 coalition government which has the support of part of the Christian community. The objective is to force the resignation of the March 8 coalition government. US troops are now deployed in Israel and Jordan. British special forces have been dispatched to Jordan. The historical background of these recent events should be understood. In 2006, Lebanon was bombed by the Israeli Air Force. Israeli troops crossed the border and were repealed by Hezbollah forces. The 2006 war on Lebanon was part of a carefully planned and coordinated military road map. The extension of the 2006 war on Lebanon into Syria had been contemplated by US and Israeli military planners. This broader 2006 military agenda was intimately related to strategic oil and oil pipelines. It was supported by the Western oil giants which control the pipeline corridors. One of the military objectives formulated in 2006 was to for Israeli to gain control over the Lebanese and Syrian Eastern Mediterranean coastline, namely to establish a coastal corridor extending from Northern Israel to Southern Turkey. Another important strategic objective for Israel is the control over offshore gas reserves in the Eastern Mediterranean, including those Gaza, Lebanon and Syria. These coastal gas reserves extend from Israel’s border with Egyptian to the Turkish border. Is there a relationship between the bombing of Lebanon and the inauguration of the World’s largest strategic pipeline, which will channel more than a million barrels of oil a day to Western markets? One day before the Israeli air strikes, the main partners and shareholders of the BTC pipeline project, including several heads of State and oil company executives were in attendance at the port of Ceyhan. They were then rushed off for an inauguration reception in Istanbul, hosted by Turkey’s President Ahmet Necdet Sezer in the plush surroundings of the Çýraðan Palace. Israel’s Minister of Energy and Infrastructure Binyamin Ben-Eliezer was present at the venue together with a delegation of top Israeli oil officials. The BTC pipeline totally bypasses the territory of the Russian Federation. It transits through the former Soviet republics of Azerbaijan and Georgia, both of which have become US “protectorates”, firmly integrated into a military alliance with the US and NATO. Moreover, both Azerbaijan and Georgia have longstanding military cooperation agreements with Israel. But there is another dimension which directly relates to the war on Lebanon. Whereas Russia has been weakened, Israel is slated to play a major strategic role in “protecting” the Eastern Mediterranean transport and pipeline corridors out of Ceyhan. The bombing of Lebanon is part of a carefully planned and coordinated military road map. 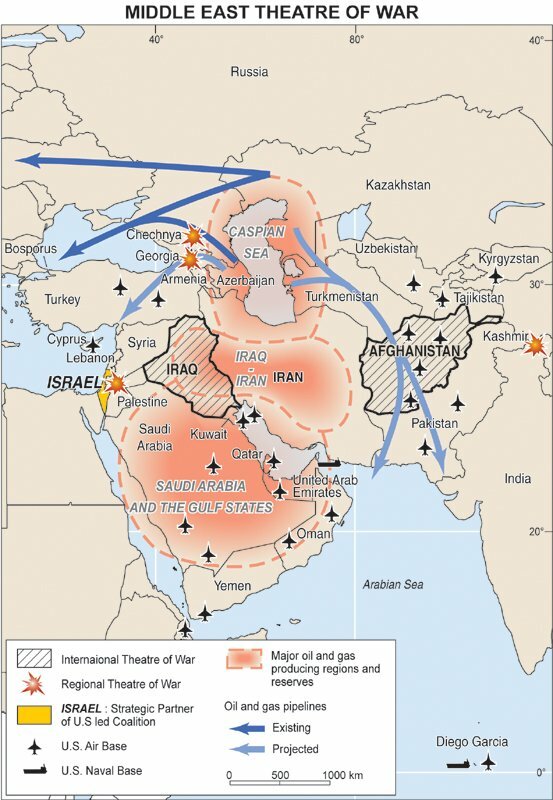 The extension of the war into Syria and Iran has already been contemplated by US and Israeli military planners. This broader military agenda is intimately related to strategic oil and oil pipelines. It is supported by the Western oil giants which control the pipeline corridors. In the context of the war on Lebanon, it seeks Israeli territorial control over the East Mediterranean coastline. While the official reports state that the BTC pipeline will “channel oil to Western markets”, what is rarely acknowledged is that part of the oil from the Caspian sea would be directly channeled towards Israel. In this regard, an underwater Israeli-Turkish pipeline project has been envisaged which would link Ceyhan to the Israeli port of Ashkelon and from there through Israel’s main pipeline system, to the Red Sea. What is envisaged is to link the BTC pipeline to the Trans-Israel Eilat-Ashkelon pipeline, also known as Israel’s Tipline, from Ceyhan to the Israeli port of Ashkelon. In April 2006, Israel and Turkey announced plans for four underwater pipelines, which would bypass Syrian and Lebanese territory. Also involved in this project is a pipeline to bring water to Israel, pumping water from upstream resources of the Tigris and Euphrates river system in Anatolia. This has been a long-run strategic objective of Israel to the detriment of Syria and Iraq. Israel’s agenda with regard to water is supported by the military cooperation agreement between Tel Aviv and Ankara. Ultimately, this design is intended to weaken Russia’s role in Central Asia and cut off China from Central Asian oil resources. It is also intended to isolate Iran. Meanwhile, Israel has emerged as a new powerful player in the global energy market. Tartus is strategically located within 30 km. of the Lebanese border. Moreover, Moscow and Damascus have reached an agreement on the modernization of Syria’s air defenses as well as a program in support to its ground forces, the modernization of its MIG-29 fighters as well as its submarines. (Kommerzant, 2 June 2006). In the context of an escalating conflict, these developments have farreaching implications. The implementation of a land-based corridor, as opposed to the underwater pipeline project, would require the militarisation of the East Mediterranean coastline, extending from the port of Ceyhan across Syria and Lebanon to the Lebanese-Israeli border. Is this not one of the hidden objectives of the war on Lebanon? Open up a space which enables Israel to control a vast territory extending from the Lebanese border through Syria to Turkey. It is worth noting that the US War Academy had already contemplated the formation of a “Greater Lebanon” which would extend along the coastline from Israel to Turkey. In this scenario, the entire Syrian coastline would be annexed to an Anglo-American Israeli protectorate. 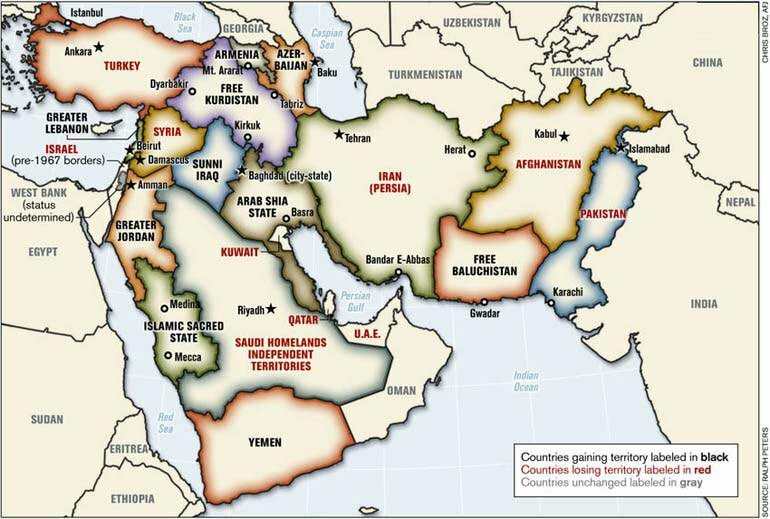 (See Map of The New Middle East below). Israeli Prime minister Ehud Olmert has stated that the Israeli offensive against Lebanon would “last a very long time”. Meanwhile, the US has speeded up weapons shipments to Israel. There are strategic objectives underlying the “Long War” which are tied to oil and oil pipelines. Michel Chossudovsky is the author of the international best seller “The Globalization of Poverty ” published in eleven languages. He is Professor of Economics at the University of Ottawa and Director of the Center for Research on Globalization, at www.globalresearch.ca . He is also a contributor to the Encyclopaedia Britannica. His most recent book is entitled: America’s “War on Terrorism”, Global Research, 2005. To order Chossudovsky’s book America’s “War on Terrorism”, click here.